To the delight of Virginia political junkies, the Old Dominion has a notable election every November, with federal contests in even-numbers years and state elections in odd-numbered ones. So it’s always “on to the next one,” with eyes now turning to the state’s 2017 gubernatorial election to succeed Gov. Terry McAuliffe (D). Virginia is unique in that it does not permit its governors to seek reelection (though they can run for non-consecutive terms), so McAuliffe is term-limited. Until last week, all the action appeared to be on the Republican side, with four candidates in the field to the Democrats’ one. Then word began to spread that Tom Perriello (D), a former State Department envoy and former one-term member of Congress[*], would run for governor. As Perriello has officially announced his candidacy, now we are really off to the races, with compelling primaries for governor in both parties. As we begin 2017, many eyes are understandably trained on President-elect Donald Trump as his inauguration nears. But the Virginia gubernatorial contest in November 2017 (as well as New Jersey’s) will be one of the first electoral tests of how Trump is playing nationally, especially considering the proximity and influence of Washington, DC on Virginia’s politics and economy. With that in mind, let’s make our first deep dive into the race to be the Old Dominion’s next chief executive. This week, we’ll tackle the suddenly interesting Democratic primary, and next week we’ll tackle the Republican primary. After Democrats won all three statewide government offices in 2013, the table seemed set for a competitive and costly gubernatorial primary in 2017. After all, it was natural to think that both Northam and Attorney General Mark Herring (D) would be interested in taking over the top job in Richmond. Once Northam announced his gubernatorial candidacy in February 2015, all eyes turned to Herring. In September 2015, the attorney general announced that he would run for reelection instead of governor, meaning that Virginia Democrats had seemingly avoided a contentious battle for its gubernatorial ballot line. It did not seem as if Northam would face much opposition, allowing him to focus on raising money and building a general election campaign. But Perriello’s entry into the race upset the apple cart, much to the pleasure of Virginia Republicans. Instead of keeping his powder dry until the general, Northam will be forced to spend resources in a primary against a credible threat to his previously-assured nomination. Still, Northam has the backing of most state party leaders, including Sens. Tim Kaine and Mark Warner, as well as McAuliffe, Herring, and others. Perriello is challenging the establishment-backed candidate, which has precipitated comparisons to the Democratic presidential primary contest between Hillary Clinton and Bernie Sanders in 2016. At least in the sense of establishment-versus-insurgent, the analogy works. Virginia party leaders wanted Northam to have a glide path to the nomination just as most national Democratic Party leaders wanted the same for Clinton. But establishment-versus-insurgent doesn’t automatically mean moderate-versus-liberal. In fact, both have moved to the left since they first entered elected office. Though he will likely be seen as running to the left of Northam, Perriello ranked as the 248th most-liberal member out of the 262 Democrats who served in the U.S. House at some point during the 111th Congress, according to the DW-Nominate measure of ideology based on career congressional voting record. Personally opposed to abortion but pro-choice in outlook, Perriello voted for the Stupak-Pitts Amendment in 2009, which added language to the House version of the Affordable Care Act to prohibit federal money going toward abortions (the amendment was not included in the final version of the bill, though). He was also endorsed by the National Rifle Association during his 2010 reelection bid. Given that he represented a district that John McCain won 51%-48% in 2008, Perriello’s moderation was unsurprising — political pragmatism surely played a part. But Perriello also made his Catholic faith a major part of his political profile, having done work with faith-based initiatives before running for office. Despite his broadly centrist record, Perriello was a favorite of progressives in part because he backed President Obama on big-ticket items such as the stimulus, Obamacare, and Cap and Trade. Perriello earned plaudits from the left for his 2010 reelection campaign, in which he embraced his politically-risky votes rather than run from them. He became a favorite of the president, who campaigned with Perriello in October 2010. Though Perriello lost reelection, his 3.8-point defeat in a tough district during a Republican wave appeared to affirm his approach. In line with his votes on contentious bills while in Congress, Perriello showed a more liberal outlook after leaving Congress, particularly in his time as president and CEO of the Center for American Progress Action Fund, the advocacy wing of DC’s preeminent liberal think tank. Perriello also has experience in international affairs, most recently as a special envoy for the Obama administration to Africa’s Great Lakes Region. This has led some to wonder whether Perriello might actually be a better fit as a Senate candidate, but Hillary Clinton’s surprising presidential loss kept Kaine, Clinton’s running mate, in the Senate, and he plans to run for reelection (Warner, the state’s other senator is also a formidable force in Virginia politics). So even if Perriello wanted to run for the Senate, his path was blocked. At first glance, Northam appears to be a more traditional, centrist Virginia Democrat. A native of the Eastern Shore, he graduated from the Virginia Military Institute, went to medical school, and served in the military as an Army doctor. First elected to the Virginia Senate in 2007, Northam has been described as “low-key” and “folksy” in his demeanor. At the start of his Senate tenure, Northam found ways to work with Republicans. For example, he crossed over to work out a compromise on judicial appointments, which in Virginia are controlled by the General Assembly. He then became part of a four-member (two Democrats and two Republicans) “Commonwealth Caucus” that aimed to rise above partisan divides, particularly on judicial appointments, redistricting, and protecting the Chesapeake Bay and natural resources. With Democrats holding a narrow 21-19 majority in the Senate, Northam even considered voting to give the GOP equal power on two key committees in early 2009, and the GOP also tried to convince him to switch parties, which would have shifted Senate control to the Republicans. Whether he truly considered switching parties is unclear, but the possible waffling worried Democrats. Following redistricting in 2011, Northam’s seat went from being a district that George W. Bush won by nine points in 2004 to one that Obama carried by 15 points in 2008 (and 14 in 2012). This may help account for his more liberal turn, but nevertheless Northam gained notoriety in 2012 when he helped lead the Democratic effort to combat a GOP-backed bill that would have required women to get a transvaginal ultrasound before getting an abortion. Running for lieutenant governor in 2013, Northam utilized his background as a doctor — he’s a pediatric neurologist — to frame his support for women’s reproductive rights, Medicaid expansion, and gun control. In the primary, Northam surprised some by defeating former Chief Technology Officer of the United States Aneesh Chopra. Northam then ran a quiet general election campaign in a race that was never competitive, overshadowed by competitive contests for governor and attorney general. Thus, while Northam has described himself as a fiscal conservative and said during the ultrasound debate that Richmond needed more moderates, he has positioned himself as a solid liberal advocate on two core Democratic issues — abortion and gun control. These are two issues where Northam may be able to get to Perriello’s left, given the former congressman’s one-time backing from the NRA and support of the Stupak-Pitts Amendment. Perriello must know these are potential vulnerabilities: In 2013, he criticized the NRA as being a representative of gun makers rather than gun owners, and Perriello may use a similar line if pressed in the primary. On abortion, one of Perriello’s first acts as a candidate was to issue a lengthy Facebook statement about his position, where he expressed regret for his vote on Stupak-Pitts. Overall, the fact that both candidates are ideologically complicated means that this contest could become more about stylistic differences — the tenor and tone of the candidates — than large policy differences. At this point, Northam holds an initial monetary advantage. At the end of June 2016, he had nearly $1.4 million in his campaign war chest, a number that has surely grown in the past six months. 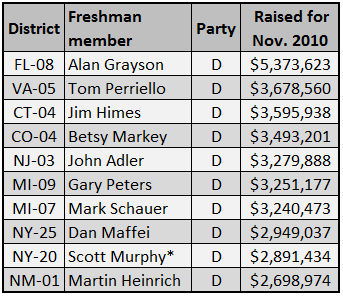 Perriello has no money in the bank at this point, but keep two things in mind: First, Perriello was a prodigious fundraiser in the House, raising the second-most money of any House freshman seeking reelection in November 2010 (Table 1); and second, as lieutenant governor, Northam cannot raise money while the General Assembly is in session. Thus, he won’t be adding to his total for most of the first two months of 2017, giving Perriello time to make up ground. As people turn their attention to the gubernatorial contest, the first quarter of the year is naturally important and often lucrative: For example, McAuliffe, a prolific fundraiser himself, collected $5.1 million in the first three months of the 2013 race. And money will matter, at least to some extent. For instance, if the candidates want to run TV ads in Northern Virginia — part of the expensive Washington, DC television market (among the 10 largest in the country) — it will cost them an arm and a leg. And Northam and Perriello will also want to spend some resources in the Hampton Roads and Richmond markets, which are both top-60 markets nationally in size. Northern Virginia may be a particularly interesting battlefield in this contest as neither candidate hails from the area, which is the most important region in the state for Democrats. Table 2 lays out regional data from recent statewide primary and general elections for Democrats. In the last Democratic gubernatorial primary in 2009, 39.5% of the votes came from greater Northern Virginia. Of course, in a low-turnout primary, the candidates’ home bases can especially affect regional turnout. In 2009, two of the three candidates had Northern Virginia ties, while Northam’s candidacy boosted Hampton Roads’ turnout in his 2013 primary for lieutenant governor (and Herring’s concurrent primary for attorney general helped Northern Virginia turnout that year as well). In 2005, two of the four candidates for lieutenant governor were from Northern Virginia, but in 2001 none were, and the contrast between the two cycles is remarkable. It would be helpful to have another Democratic gubernatorial primary data point, but the last one before 2009 was in 1977, a hard-fought and testy contest that Democrats will not want to see a repeat of 40 years later. Based on these data points, it seems reasonable to expect Northam’s candidacy to drive up Hampton Roads’ percentage of total turnout, perhaps above 25% again, and for Perriello’s candidacy to somewhat boost turnout outside the Urban Crescent — the 5th District exists mostly outside of those regions. Northam could run up big margins in his home territory, meaning that for Perriello to have a chance, he will probably have to beat Northam in Northern Virginia and in Greater Richmond. But Northam managed to beat his 2013 primary opponent 52%-48% in Northern Virginia, so he has a track record for holding his own in that part of the state. Next week we’ll look at the Republican primary and also offer some thoughts about the general election coming up in November. [*] In the interest of full disclosure, the author served as an unpaid intern in Perriello’s Washington, DC office in the fall of 2009 shortly after finishing his undergraduate degree at the University of Virginia.